And so we all returned to Old Street once more this week for the final push. It’s been quite an undertaking installing nearly 90m2 of living wall, but we’re done, and the whole team firmly believe it’s been worth it. The client is delighted with the results and everyone who’s seen the walls either up close and personal or via our Instagram feed (the.landscape.architect) seems to like them too. 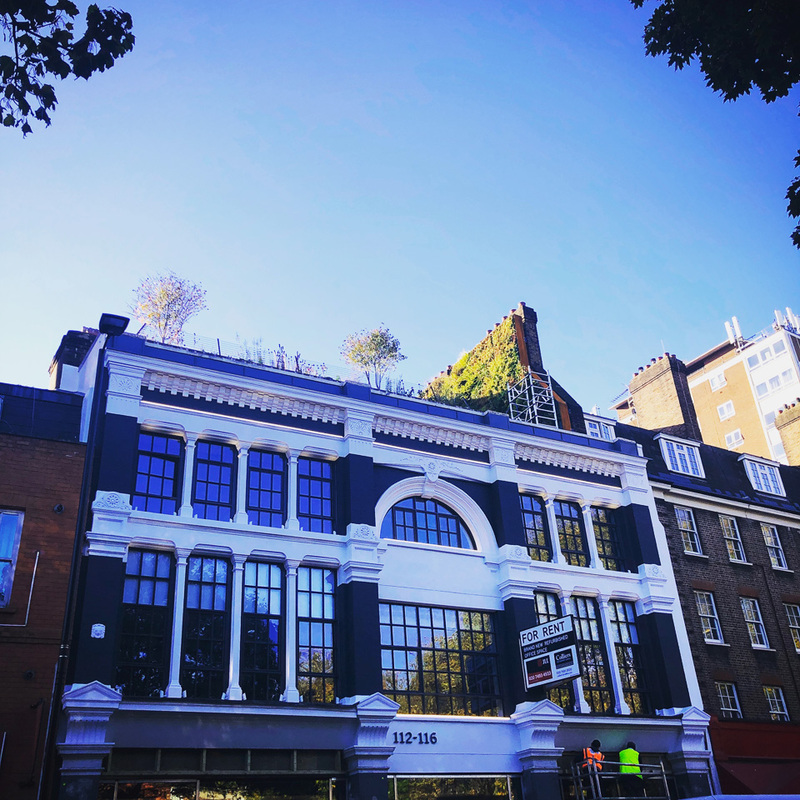 Personally, I think installing living walls and roof gardens in the heart of our ever expanding capital city sends out a very positive message. I firmly believe urban greening has an important role to play in the future health of our cities. There are lots of facts and figures being published about the possible positive effects of greenery in the city, some of which may well be proven to be true, others may not. One thing I am confident about (and to be clear this is only my humble opinion) is that they look great and they will have a positive effect on anyone who is lucky enough to have a desk in an office that looks out onto one. Despite his best intentions to write a blog every week this year Adam got distracted over the summer by the mountain of work we have had to deal with. Well that is what he says. Personally I suspect the amazing weather and gorgeous Devon beaches may have had something to do with it. This photo is of the beach that is about half a mile from our nursery. Hmm…. It’s hotting up, down in Devon… and things are starting to get a little crowded at the nursery in South Milton. We’ve got multiple living walls developing nicely, all ready and waiting to be shipped to various locations across London. 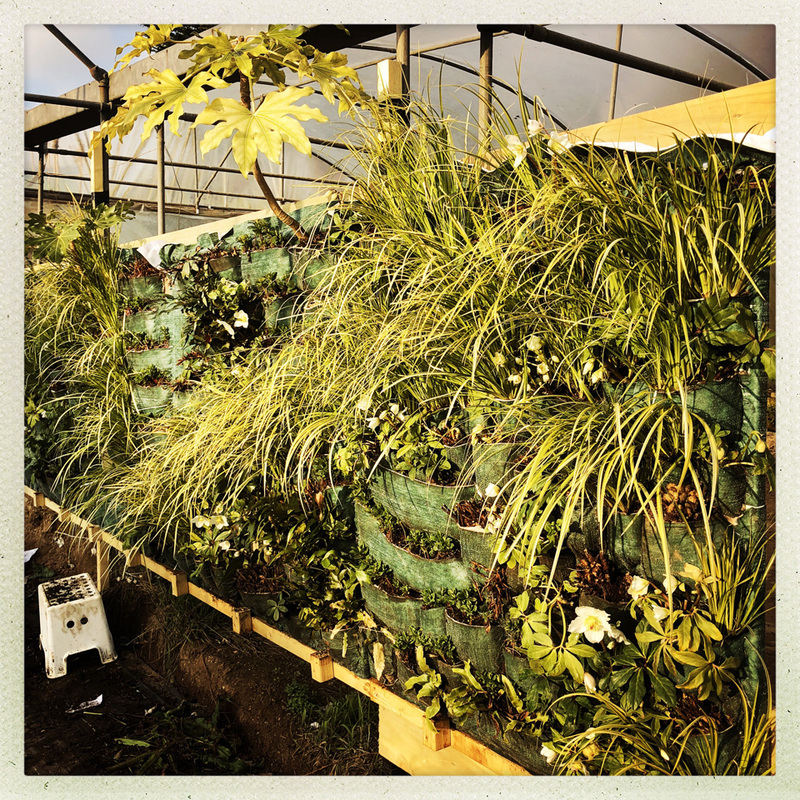 Whenever possible we like to plant the walls well in advance of the installation date, allowing us to keep a close eye on the plants as they develop and grow, sending out roots and settling in to their new vertical home. This week I’m back in London to check on a number of living walls we’ve installed over the last few years. A couple needed a little attention, others however required nothing more than for me to stand and appreciate what a fantastic job everyone who is involved with producing our living walls has done. When our combined hard work comes together and the plants start doing there thing… well it’s simply a pleasure to behold. This wall in Swiss Cottage was installed just a few months ago, and I am absolutely delighted. It’s one of our best yet. Congratulations team TLA for a job well done. The well heeled folk who reside in the exclusive Royal Borough of Kensington and Chelsea (London) are always well turned out and looking their best. The cars on the streets are shiny, supercharged and often driven by chauffeurs. The facades of houses are tall, white and often hide a multitude of fabulous treasures behind them. Last week Will returned to check on this living wall, created for one such home owner a few years back and took these images so I could assess (from my sleepy seaside retreat) how the wall is doing. I say it’s doing just great, looking good, dressed in it’s horticultural finery. The Erysimum ‘Bowles’s Mauve’ is almost always the first down the catwalk with the Campanula poscharskyana ‘Stella’ not far behind. However, I’m more than happy to wait a little longer for my favourite, the Begonia grands subs. evansiana to stride out for the finale (and usually close the show). With it’s nodding clusters of slightly fragrant pale pink or white flowers I’ve loved this beauty from the first time I cast my eye upon it. Bravo! This week, we returned once more to sunny Nottingham. Dr Neil Rotherham’s garden is fabulous. He’s a great gardener. I’ve never told him this, but when he asked us to create him a living wall that he could enjoy from his new kitchen window, I was slightly nervous. It’s a tricky spot, occupying a once forgotten shady slice of the garden that runs down the side of the house. It was one of those awkward, overlooked spaces… but it is no longer ignored or unloved. It is now celebrated, admired and commented on over a glass of wine. Best of all it is now a much loved space and one in which Dr Rotherham spends many an hour gently pruning off dead leaves and spent flower heads. It is quite easy to pick up an injury in our line of work if you are not careful. A sore back from too much digging. Shredded arms from clearing brambles. Cut fingers from pruning. A mild case of sunstroke or frostbite from being exposed to the elements. Tick. Tick Tick. Tick. I never expected that I’d manage to break a thumb though. Whilst not being able to drive for six weeks is a complete pain I guess I should be thankful that my thumb doesn't actually hurt very much. Whilst Adam is enjoying the delights of rural Devon I have been getting to enjoy the delights of a building site on Old Street. Lucky me. Actually the view from the roof terrace is pretty good, especially on a sunny day. 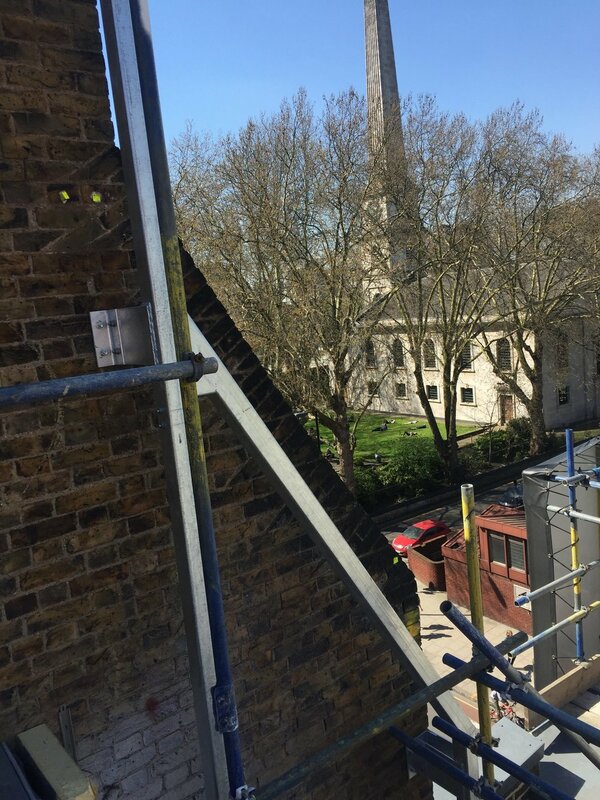 It is nice to know that it will be even better in a few months once we have installed a large living wall that tracks the shape of the neighbouring building’s gable end. My only slight concern is all the working at height we will be doing - I’d have taken a photo of the view to the pavement but I didn’t dare get that close to the edge of the terrace! The full TLA team all met up in London this week to install not one but two living walls. Alan and the Stevington squad brought their walls for a fab courtyard in Highgate whilst I (the current Devon team) brought up my latest offering which slotted straight into a wonderfully modern garden in St Johns Wood designed by John Davies. 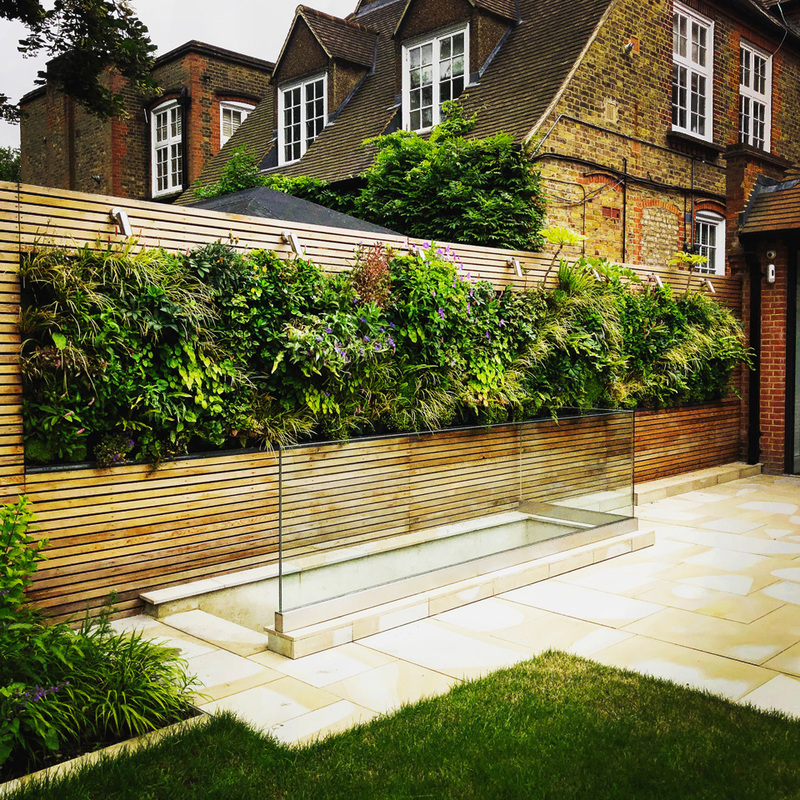 John’s a fabulous designer who we’ve produced a number of living walls for over the years and you can see his beautiful portfolio of gardens here. Snow, sledging and slipping around. I fleeced up the living wall that I’ve just finished (installing next week in St. John’s Wood) and headed for the slopes! Well, our own personal sledging field which sometimes doubles as a farm. Much fun was had by all including yours truly. Just adding a few finishing touches to this living wall destined for St Johns Wood in London. In a rare blast of early spring sunshine the Helleborus Niger are already starting to flower! I thought I’d share my latest plan. This is how it all starts. I hand draw all my vertical planting plans. This is the first draft showing my go to backbone plants. Not shown are the special plants that are sprinkled on top like hundreds and thousands on a birthday cake. These exotic rarities (such as the Saxifrage stolonoifera ‘Ginkgo 98’ PB) are not always spotted by clients but I like to hide a few surprises in amongst the greenery nonetheless. The devil is, as they say, in the detail. “The devil is in the detail” is an idiom that refers to a catch or mysterious element hidden in the details, meaning that something might seem simple at a first look but will take more time and effort to complete than expected and derives from the earlier phrase, “God is in the detail" expressing the idea that whatever one does should be done thoroughly; i.e. details are important. When it comes to our living walls - I agree completely.